The title of my blog is Amazing in Motion because that is how I feel when I am active. I wear many hats. 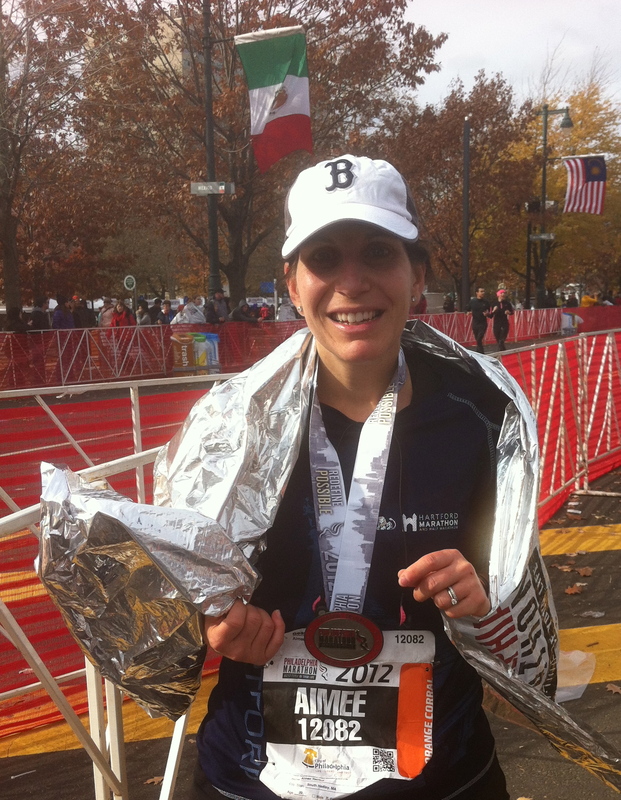 I am a mom, a wife, a nurse and now a runner. My name is Aimee. I am a 42 year old woman from Massachusetts. I became a mom in 2006 when my son, Carlos, was born. It was instant love. I consider being a mom my most important job. I met and married my husband, Orlando, in Mozambique where he is from. Perhaps if this blog ever takes flight I will share our story. It is unique and very sweet. I adore my husband and I continue to find him more handsome than when we first met in 1999. I am a registered nurse. Until recently I worked full time as a behavioral health nurse. As of mid-November 2014 I am working as a nurse case manager for a large insurance company. For over 8 years I worked the 11pm to 7am shift while maintaining an active lifestyle, raising a child and tending to day to day family life. Now I will learn to do the same while working during the daylight hours. Last but certainly not least I have discovered something else about myself. I am a runner. ME!!! I ran a 5K in 2009 but I still didn’t refer to myself as a runner. In 2010 I trained all summer for a half marathon which I finally ran in October of the same year. Now I am proud to say that I do consider myself a runner. It’s not because of the races I’ve run, it’s because I truly love to run. I continue to set new goals to keep running challenging and exciting, but there is nothing more thrilling to me than hitting the trail around my favorite reservoir on a gorgeous fall day. If I don’t get to go for a run as planned then I am genuinely disappointed. That is what makes me a runner. Overall I am truly a positive person with a lot to be thankful for. I try to make the most of each day. I love learning new things. I love trying new things. For as long as I can remember I have struggled with weight loss. I am here because I was so inspired by a number of healthy living blogs to stop focusing on numbers and ideals and just start living as healthily as possible. I hope that in some small way perhaps I too can inspire someone to get up, get moving and give life a try. If you have any questions for me please feel free to email me at aimeer828@gmail.com. I would love to hear from you! Thanks for stopping by. Hi Lindsay thanks so much for reading. I work 32 hours a week and I have a set schedule which rotates every two weeks because I work every other weekend. I actually love working nights. My husband and I have a good system worked out and I speak up if I feel like I need more rest. I have been working nights for 5 years. So far so good! Interesting story, Aimee. Do you ever get knee issues when you run? I’m prone to them myself, otherwise I might try running too. I immediately headed to Goodreads when I noticed it on your sidebar and found out I’ve read many books on your list. I’ve read McCarthy’s Road too – impressive but also very depressing. Satu “Road” took me ages to read and I still can’t bring myself to read the very last bit. It was one of the most emotionally taxing books I have ever read. McCarthy really has a way with words. I’m going to finish it though. I’m knocking on every bit of wood I can find right now. I haven’t had any knee issues. The injuries (broken toe and broken rib) I had during marathon training were unrelated to running but definitely affected my running. I know that running is hard on the body and I try to stay very aware of how my body feels so that I don’t push when my body needs a break. Hi Aimee, Just read your comment on my blog and tracked you down 🙂 I hope one day I can call myself a runner, I started as a person who could barely jog for a minute and now I can manage 7 – 10 k but I have yet to run a race, I’m hoping I can run a marathon one day…I enjoy my run and like you I do get disappointed if I miss my workout I truly enjoy them.Your race page is very inspiring. Thanks so much Tanvee. If I can run a marathon I think anyone can do it. You are a runner whether you are running races or not. However, I will warn you the races are addicting!